Here's an easy, tasty way to use up all that leftover ham rather than just on sandwiches. Now, there's nothing wrong with a ham sambo (particularly when slathered with home-made pickles or chutney), but about four days after Christmas I'm over them for a while. These fritters are simple to make and hit the spot for a light lunch or tasty dinner with a salad and a slice or two of crusty bread. And you can use leftover turkey, salmon or prawns if that's what you have in the fridge. It's important to be aware of proper storage for leftover meat; don't leave it out in the heat after lunch but chill it quickly. Combine yoghurt, garlic and one tablespoon of the olive oil in a small glass or china bowl; cover and refrigerate. Sift flour into a large bowl. Season with salt and pepper to taste. In a separate bowl, lightly whisk eggs and milk. Add to flour, stirring until smooth. Add rice, ham, zucchini and green onions (reserve some for garnish). Stir gently to combine. Heat a non-stick frypan with the remaining olive oil over medium heat. Place large spoonfuls of the mixture into frypan, flattening slightly with a spatula. Cook for 3-4 minutes until fritters begin to set and edges start to brown. Turn carefully and cook other side for 3-4 minutes. Remove from heat. Arrange fritters on plates. 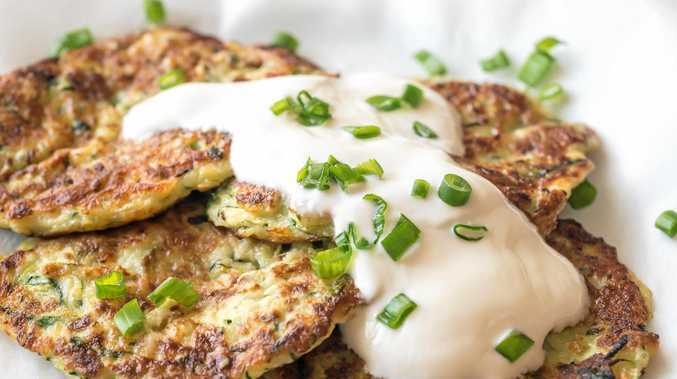 Drizzle with yoghurt sauce and scatter with remaining green onion.